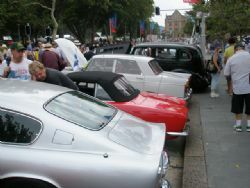 This year for the Australia Day NRMA Motorfest I decided to go in later in the day and check out the huge turnout of classic cars and hopefully dodge the massive crowds that roam up Macquarie and College Streets in Sydney. My first win was the day wasn’t a stinker (weather wise) like last year and the crowds late in the afternoon were thinner, albeit there were still throngs there. The format for this event hasn’t changed and it pulls a thousand plus veteran, vintage and classic cars, military vehicles, race cars, vintage buses, old fire trucks, bikes and a superb collection of restored fifties and sixty caravans. It forms part of the Festival of Sydney and offers lots of food and entertainment options in Hyde Park for the kids. Having attended the event for the last few years I was interested to see what automobiles were on show in 2011. The event is predominately made up of clubs - and the array included all the usual suspects from British, Australian, Japanese, European and American origin covering some very early examples of 1900 models through to the early nineteen eighties. This is a great event to see a wide selection of cars from all over the planet and covering all the decades from the past century of motoring. A lot of the owners are only too happy to have a chat about their ride and I found myself engrossed with a number of owners going over their history with some very unique cars. It was difficult to pick the car I would have liked to drive home this year as there were plenty of top shelf classics on offer but there was one car that captured the crowd and had people gawking, reading the board and checking it out in minute detail. 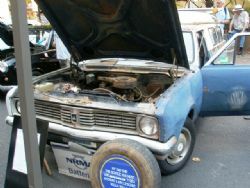 No, it wasn’t the high end exotics pulling the crowd; it was a 1970 ex NRMA HG Panel Van. 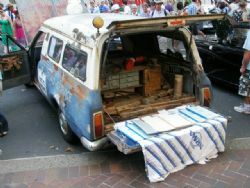 The old van, resplendent with years of mould still growing on the body panels was pulled out of a paddock in NSW. It was decommissioned and parked beside a shed and over the years various people made offers to buy it, but the owner wasn’t selling. He finally did on the basis that it would be restored – and needless to say it needs a bit of work..... The new owner has it running and it will be interesting to see if it comes back next year restored. The real interesting thing wasn’t the old HG van, but what it contained. When it was parked, they never took a single thing out of it. 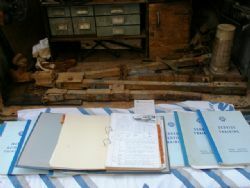 All the tools, cupboards, service manuals, customer logs – you name it, it was all still there. The manuals were absolutely pristine and what you were looking at was a total time capsule of the seventies – no mobile phones or electronics back then. Sadly after four hours of gawking, gas bagging, perving and walking it was time to cut a track. Always a great day in town, if you haven’t been to an NRMA Motorfest on Australia Day I highly recommend you put it on your bucket list. Along with all the entertainment on offer throughout the city, the cars and festivities there truly is something for every member of the family.